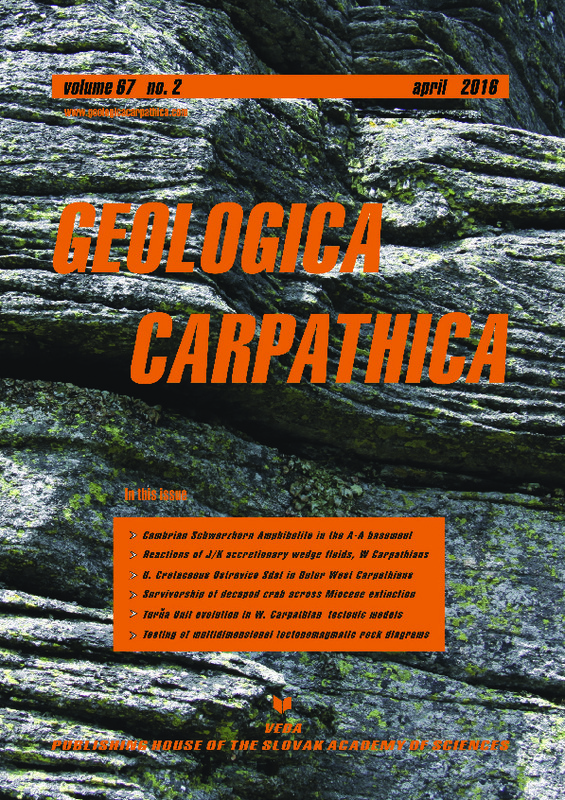 Abstract: Perovskite (Prv) was discovered in an abyssal harzburgite from a “mélange” type blueschist-bearing accretionary wedge of the Western Carpathians (Meliata Unit, Slovakia). Perovskite-1 formation in serpentinized orthopyroxene may be simplified by the mass-balance reaction: Ca2Si2O6 (Ca-pyroxene-member)+2Fe2TiO4 (ulvöspinel molecule in spinel)+2H2O+O2=2CaTiO3 (Prv)+2SiO2+4FeOOH (goethite). Perovskite-2 occurs in a chlorite-rich blackwall zone separating serpentinite and rodingite veins, and in rodingite veins alone. The bulk-rock trace-element patterns suggest negligible differences from visually and microscopically less (“core”) to strongly serpentinized harzburgite due to serpentinization and rodingitization: an enrichment in LREE(La,Ce), Cs, ±Ba, U, Nb, Pb, As, Sb, ±Nd and Li in comparison with HREE, Rb and Sr. The U/Pb perovskite ages at ~135 Ma are interpreted to record the interaction of metamorphic fluids with harzburgite blocks in the Neotethyan Meliatic accretionary wedge. Our LA–ICP–MS mineral study provides a complex view on trace element behaviour during the two stages of rodingitization connected with Prv genesis. The positive anomalies of Cs, U, Ta, Pb, As, Sb, Pr and Nd in Cpx, Opx and Ol are combined with the negative anomalies of Rb, Ba, Th, Nb and Sr in these minerals. The similar positive anomalies of Cs, U, Ta, ±Be, As, Sb found in typical serpentinization and rodingitization minerals, with variable contents of La, Ce and Nd, and negative anomalies of Rb, Ba, Th, Nb and Sr suggest involvement of crustal fluids during MP-LP/LT accretionary wedge metamorphism. LA–ICP–MS study revealed strong depletion in LREE from Prv-1 to Prv-2, and a typically negative Eu (and Ti) anomaly for Prv-1, while a positive Eu (and Ti) anomaly for Prv-2. Our multi-element diagram depicts enrichment in U, Nb, La, Ce, As, Sb, Pr, Nd and decreased Rb, Ba, Th, Ta, Pb, Sr, Zr in both Prv generations. In general, both Prv generations are very close to the end-member composition. In spite of low concentrations of isomorphic constituents, Prv-1 and Prv-2 display the A(La,Ce)3+ + B(Fe,Cr)3+ = ACa2+ + BTi4+ heterovalent couple substitution. A decrease of ferric iron in Prv-2 indicates increasing reduction conditions during rodingitization.